Chelsea face Liverpool at Anfield on Sunday as Maurizio Sarri’s side continue their battle to secure a top-four finish in the Premier League this season. The Blues start the day in fourth spot, but after Manchester United’s win over West Ham United on Saturday, the gap between the two sides is back down to just two points. Arsenal could also edge closer on Monday night, but a win for Chelsea over the Reds could see them leapfrog Tottenham back into third as the race for Champions League qualification continues. 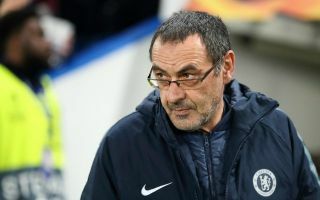 With the stakes so high, it’s no surprise that Sarri has gone for a strong starting line-up, as he opted to rotate in midweek for their Europa League clash with Slavia Prague. Eden Hazard starts after coming off the bench on Thursday night, while the decision from Sarri to start Callum Hudson-Odoi, Ruben Loftus-Cheek and Emerson in particular has gone down extremely well judging from the reaction below. Chelsea have won four in a row across all competitions with that trio proving crucial in their last two wins in the Premier League, and so the Italian tactician has seemingly decided to opt against tweaking his line-up when he seems to have found a winning formula. That also means Hazard will will adopt the false nine role up front, and as noted in the responses below, that also appears to have been welcomed by the fans in general. Nevertheless, with Liverpool going for the title this season, this will be a huge challenge for the visitors who can’t afford to drop points either. Team news is in! ?